Portrait from Uppsala University Library, Section for Maps and Images. 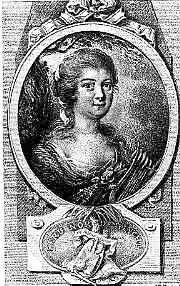 Hedvig Charlotta Nordenflycht (1718–1763) was one of the literary pioneers of the 1750s. She was extremely active in the learned society the Order of the Mind-Builders and had a literary salon in her home that many of the writers of the time attended to exchange ideas and poems. Nordenflycht’s specialty was lyrical poetry. Even as a young girl she thought a lot about life and was more interested in studying than in learning ‘women’s work.’ Her parents allowed her to study a little under her brother’s tutor, but it was of course out of the question for a girl to devote her life to books. Luckily, the family had employed Johan Tideman, a young mechanic, who was also very interested in the philosophical and literary discussions of the day, and Hedvig Charlotta could converse with him. When her father lay dying—she was only sixteen—he expressed a wish that his daughter might marry this Tideman. At first Hedvig Charlotta didn’t want to, because “He was equally dear as a philosopher to listen to as he was obnoxious to see as a suitor.” Be that as it may, they did get married. Hedvig Charlotta was to have bad luck with the men in her life. Johan Tideman died after only three years together with her. So she was a widow by the age of nineteen. The following year she met the fifteen-years-older Jakob Fabricius, who was a clergyman in Stockholm. Because one of her brothers—“a spendthrift and a wobbler”—ruined the family, her marriage had to be postponed. For three years the fiancés corresponded. When Jakob landed a position as admiralty pastor in Karlskrona, they could get married, but once they were wed Jakob died within a year. She was still involved in the philosophical questions of the time. They were about life and knowledge: Is knowledge good for humankind? Is the soul immortal? Are right and wrong inborn ideals that are always the same or are they practical rules that are shaped by our lives? Does the soul live on to face punishment or rewards in an afterlife, or is everything limited to this life? On a personal level, however, her trials were not over. Nordenflycht’s house burned down, and many manuscripts were lost. Klingenberg died, and when she was more than forty years old she fell in love with the twenty-years-younger Johan Fischerström, but encountered both rivalry and wrenching disappointment. Rumor even had it that Nordenflycht tried to drown herself in connection with this, but that rumor was denied by her friends. Nevertheless, she died in 1763, not long after these events.